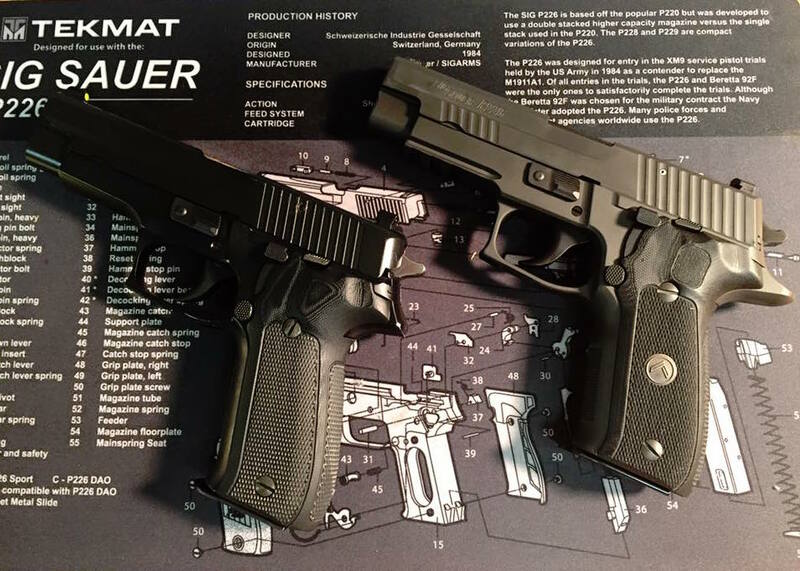 If you’ve heard someone mention proof marks or date codes when discussing a SIG Sauer pistol, but weren’t quite sure what those were, then the goal of this article is to bring you up to speed. And even if you’re already familiar with proof marks, maybe this article can broaden your knowledge and teach you something new. 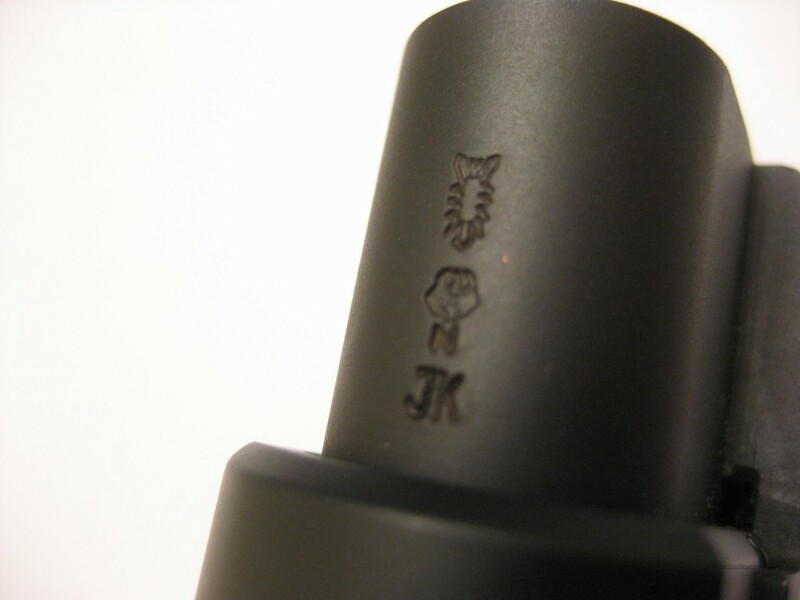 Proof marks are stamps embedded in certain parts of a firearm following (and sometimes during, depending on the firearm type) its manufacturing to indicate that the firearm has been “proven” to be able to handle the specific type of ammunition for which it was designed. In modern years, they truly do serve that purpose. But like many government regulations, their origins have more to do with self-interest than safety. The first proof marks started appearing in 15th century France, and by the 17th century, European firearms guildsmen were heavily promoting their use — and lobbying their governments for laws requiring them — primarily to dissuade competition from non-guildsmen and scare potential purchasers away from un-proofed guns. In 1637, after heavy lobbying from the London Gunmakers Company, a London-area firearms guild, King Charles I issued a Royal Charter setting firearms safety standards. The London Gunmakers Company set up a “proof house” in London, and not surprisingly… firearms makers who were not part of a guild tended to fail testing more often than the guild members. 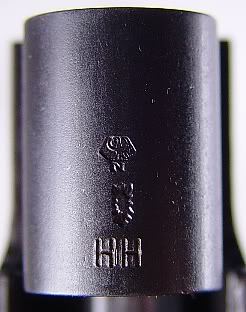 Guns that passed testing were stamped with a mark representing the proof house. 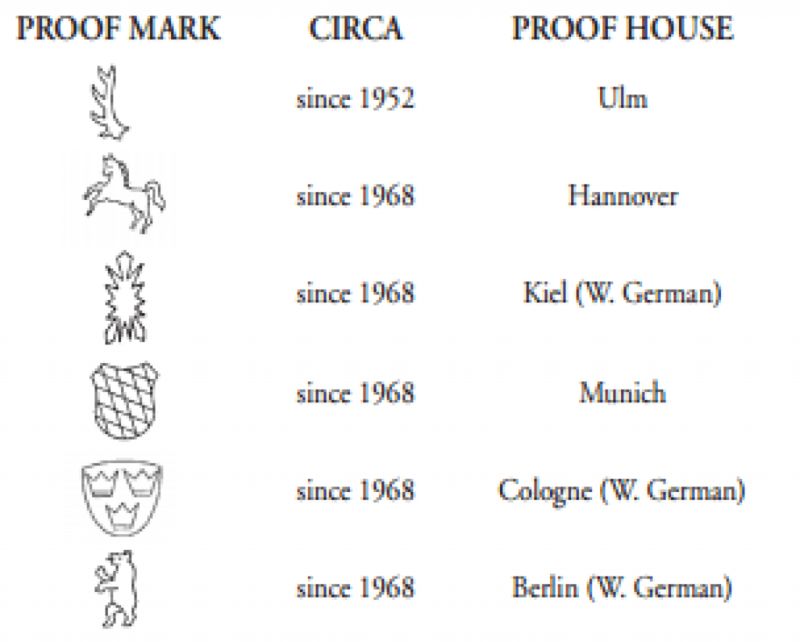 Over the next few decades, other countries established their own safety standards and proof houses, along with their own unique marks. Much like reciprocity of modern concealed carry permits between states, some European countries began to recognize each others’ proof marks as a high enough testing standard for foreign countries’ firearms to be legally imported. Fast forward to 1914, when a number of European countries formed the CIP (Commission Internationale Permanente pour l’Epreuve des Armes à Feu Portatives) as a formal standards group to ensure consistent testing among member countries. As of 2015, the CIP includes 14 member states. In order for a civilian firearm produced in a CIP member state to be legally imported to another CIP country, it must bear the proof mark of a CIP member state (military testing standards are, predictably, different than civilian ones). The United States does not participate in CIP, but instead formed its own standards group named SAAMI (Sporting Arms and Ammunition Manufacturers’ Institute). While the CIP and SAAMI do share information and cooperate, neither has a requirement regarding selling in each other’s countries. 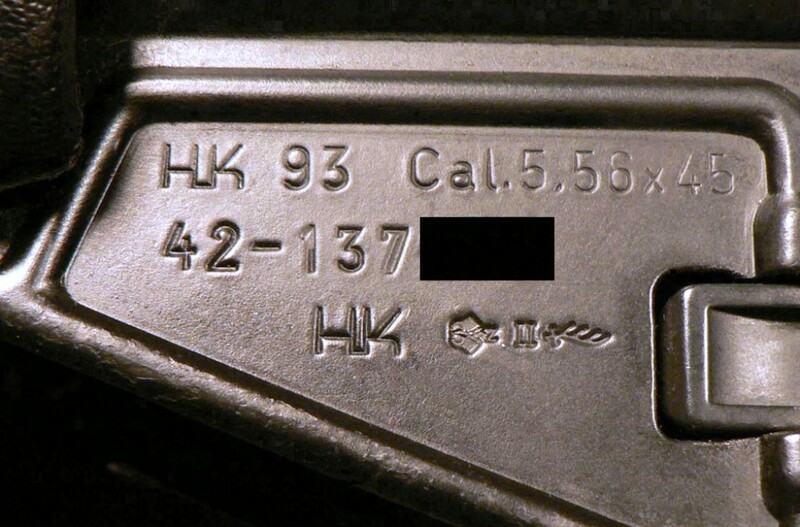 Because the US is not a CIP member state, foreign guns do not need a CIP proof mark to be sold in the US, nor do US guns need a US proof mark to be sold in CIP member countries. This is an important fact that will become relevant again later in this article. The top row (a) indicates the German (or East/West German, depending on the year) city in which the proof house is located. The column marked (b) shows varios German/West German proof marks after 1945, while the column marked (c) shows German proof marks used from 1939-1945. To make sense of these proof marks, let’s look at those on the above slide chin. 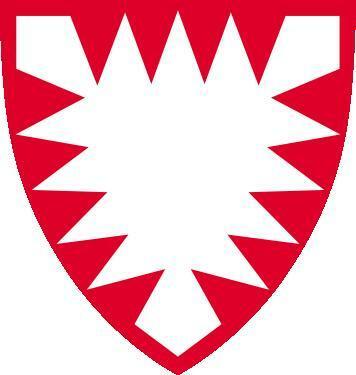 The shape represents a Nesselblatt, or nettle leaf. Tradition held that the leaves of the nettle were symbolic of the nails used to crucify Christ, so the three larger leaves represent the nails of the crucifixion. 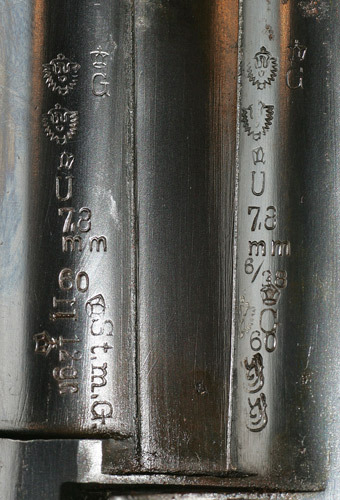 All true German and West German SIGs were test fired at the Kiel proof house, so the Nesselblatt proof mark is an indicator of a true German or West German SIG. I’ve also heard one report of the Ulm proof house’s stag antler mark appearing on a the frame and slide of a 1993 SIG P226 (in addition to the Kiel mark on the slide), which would imply that the firearm required repair and re-proofing… and presumably the repair took place at a location that was closer to Ulm than Kiel. 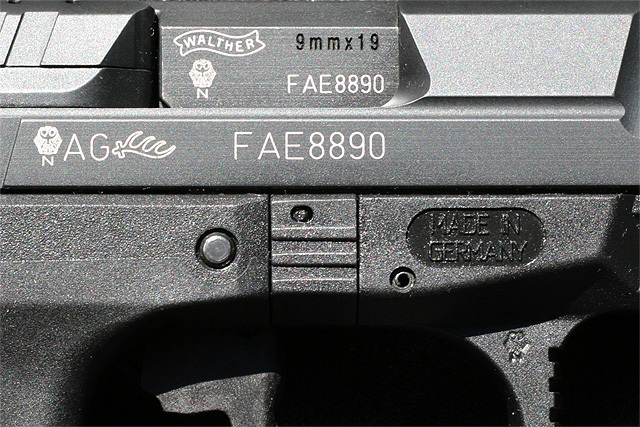 Normally, you’d expect to see the Ulm proof mark on a Walther or H&K firearm. 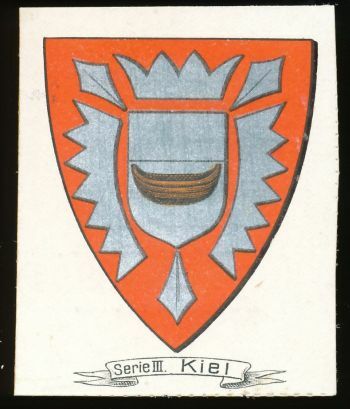 Underneath the Kiel Nesselblatt (though the order of the marks is not important), we find the image of an eagle with the letter “N” underneath. 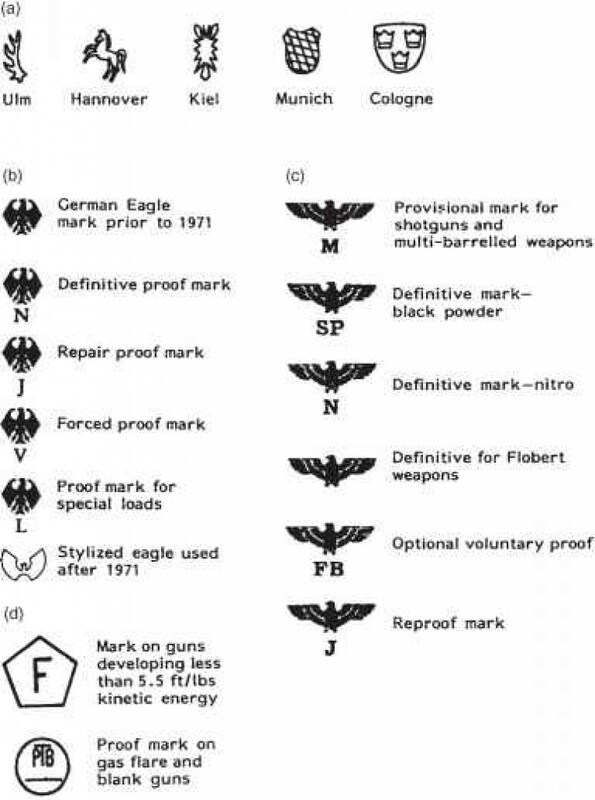 Some incorrectly believe that the eagle mark is a remnant of Nazi-era Germany, particularly since Germany’s firearms proof mark was a previously crown, and was changed to an eagle in 1939. 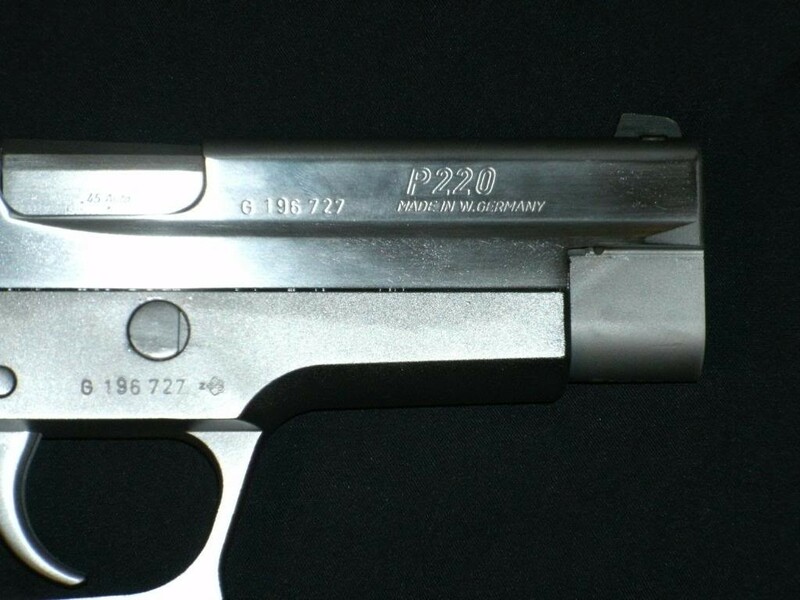 The Eagle-N mark signifies that the firearm was proofed in Germany (or West Germany, depending on when the firearm was proofed), while the “N” indicates that the firearm was proofed using a Nitro Beschuss load. “Beschuss” translates as “bombardment,” “shelling,” or “firing” depending on context, and “nitro” is short for “nitrocellulose,” a highly flammable compound used to creates pressures inside the firearm higher than standard gun powder. Pistols are delivered to the proof houses in their fully assembled form for proofing. 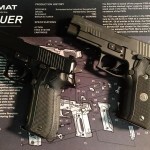 For pistols, CIP standards require cartridges that generate pressure 30% higher than the standard ammunition for which the pistol is designed, so the two high pressure nitro rounds are fired through the pistol. Technicians then disassemble the pistol and examine it in a dark room using a fluoroscopic lamp, looking for magnetic flux leakage. Provided everything looks good, the pistol is re-assembled and receives the country’s CIP proof mark indicating what type of test it passed (the Eagle-N or “definitive” mark in the case of a German gun), the mark of the proof house, and marks indicating the date of the tests. The firearms is then returned to the manufacturer who can legally sell the firearm domestically or export it to another CIP country. The “nitro” proof mark is also referred to as the “definitive” (or final) mark of the proof house, as opposed to a “provisional” mark which would generally only apply to shotgun barrels in an early stage of manufacture, which are tested at proof houses to prevent the manufacturer from continuing work on defective tubes. Using the above table, we can determine that the “JK” date code in the photo stands for “89” — meaning this firearm was proofed in 1989… which coincidentally happened to be the year the Berlin Wall came down. This doesn’t necessarily mean that the pistol was manufactured in 1989. It’s quite possible the barrel was made in 1986, the frame in 1987, and the slide in 1988… but that all the parts weren’t assembled together into a firearm and delivered to a proof house until 1989. Or it’s possible that all the parts were actually made in 1989, and then assembled and proofed that same year. There’s no way to know. 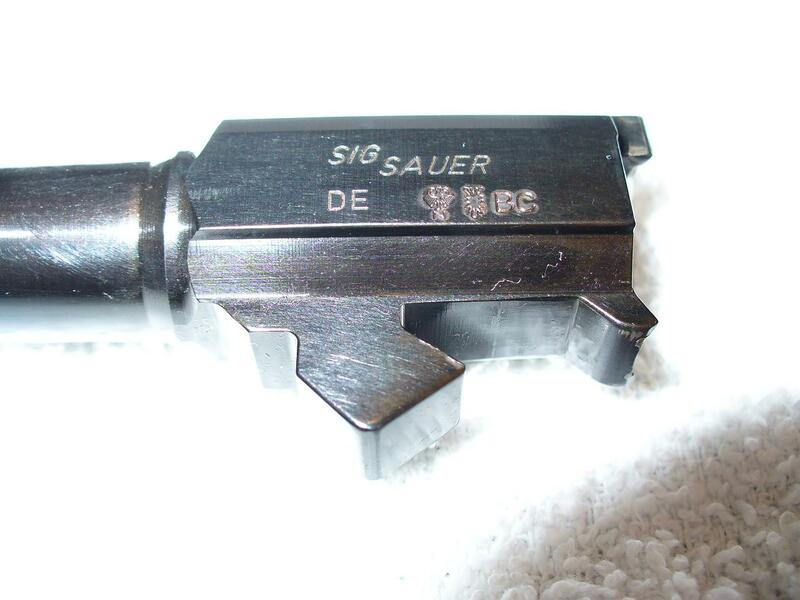 A true German / West German firearm isn’t technically “born” until it’s been proofed. 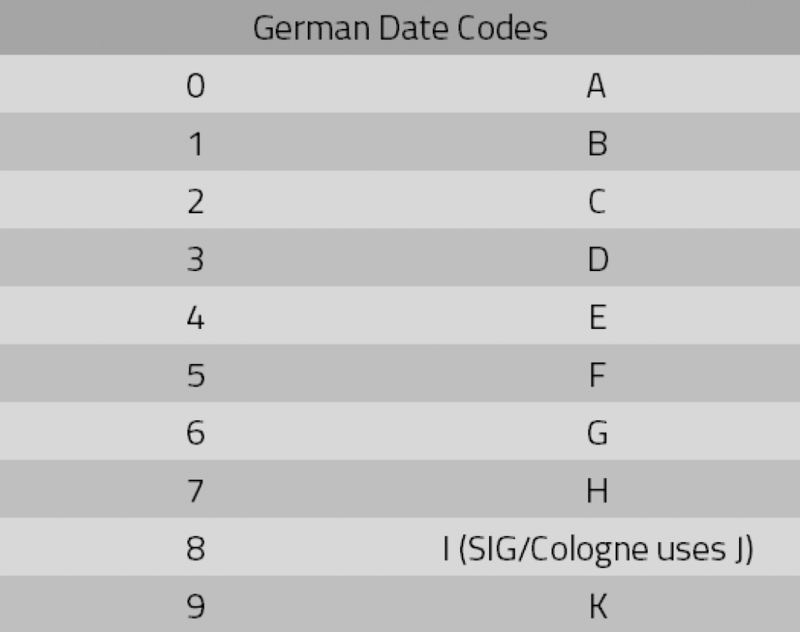 Note that a gun’s date code is different than its serial number. It’s impossible to decode a SIG serial number to determine when it was proofed, although you can try to locate the range of your SIG’s serial number in this list to approximate when it was made, or call SIG Sauer with the serial number and see if they have any info in their system. Serial numbers aren’t always truly representative of the chronological order of a firearm, but they can sometimes get you close. Only a date code can tell you the year of proofing. 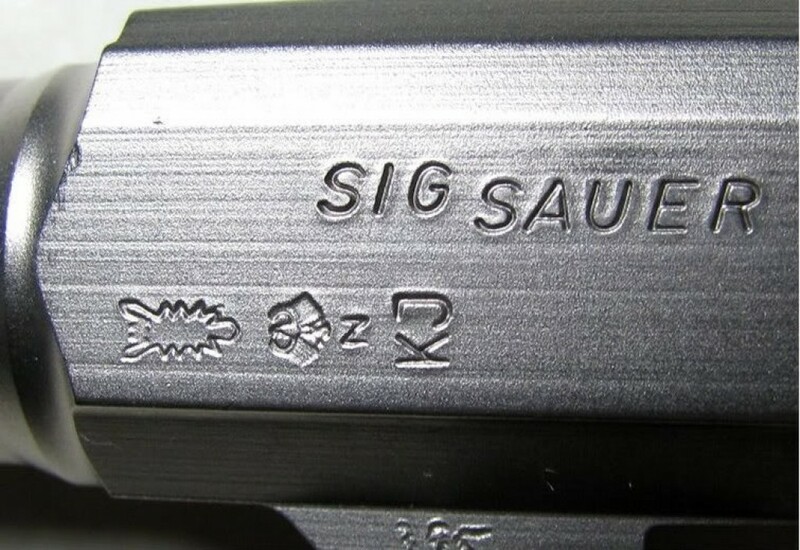 If you’ve read my article on West German vs. German vs. Other SIGs, you’ll know that proof marks are one of the primary indicators or whether a SIG Sauer (or any other firearm) is truly “made” in Germany (or West Germany) as opposed to assembled in the US using German-made parts… even though the parts might be stamped “Made in Germany.” Because the US is not a CIP country, guns marked “Made in Germany” do not need to be proofed in order to be sold here, as long as they are assembled in the US. I welcome your corrections, questions, comments, & feedback below. 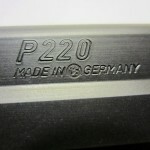 Is my "Made in Germany" (or West Germany) SIG Really German?